Barely a week goes by these days without another TV reboot announcement. Here’s an idea: How about everyone calm their respective farms and let these shows rest in peace? Boy Meets World, Full House, Coach, The X-Files, Twin Peaks, Highway to Heaven, The Odd Couple, Charmed — these are just some of the shows that have either already gotten or are about to get the reboot treatment. All of these reboots have two things in common (aside from making it glaringly apparent that TV execs have clearly run out of new ideas): 1. They are wholly unnecessary, and 2. They play on the idea of nostalgia, a thing people seem to really be craving these days. But here’s the thing: The only true way to spark that nostalgia is by watching these shows in all their original glory. It’s not nostalgic to watch revivals of these shows because they aren’t the same thing we originally fell in love with and everything that made those shows so important to viewers back in the day is not the same now — sometimes more than 20 years after the show originally aired. The Full House reboot is a perfect example. Let me be clear: I loved Full House. Some of my earliest memories of life, and not just of TV, involve Full House. It was my first full-blown television obsession and is, therefore, at the root of this wonderful love affair I have always had with the small screen. And I still love the show now, but for entirely different reasons than why I loved it as a kid. As a child, I thought the show was freaking hilarious. As an adult, my sense of humor has, thankfully, evolved, and so it’s not still magical to me because of its comedy; instead, its appeal to me now lies in the fact that it reminds me of a time when I was innocent enough to appreciate its comedy and overlook what I now realize was an incredibly dark underlying premise for a sitcom essentially aimed at children — a man loses his wife, and his three daughters, one of whom is practically a newborn and the oldest of whom is 10, lose their mother. Fuller House will, presumably, find its audience among those who watched Full House as children — i.e. people who are now adults. And while I can certainly appreciate the symmetry the reboot is going for, now that I’m an adult and not an innocent 5-year-old with little understanding of the concept of death, it doesn’t sit great with me that D.J. Tanner — a character who has such a special place in my heart — not only lost her mother at 10 years old, but is now a pregnant widow with two children. Like, seriously? Someone give this girl a break. Not to mention, the whole concept of having to watch an inevitable D.J. Tanner birthing scene feels weird for reasons I can’t quite articulate. Plus, how is a show that was so reflective of a simpler time — before smartphones, Facebook, Instagram, Twitter, sexting, internet bullying — going to work when it’s transplanted into such a different era? A big part of Full House‘s appeal to me as an adult is that the problems tackled in each episode seem so simple compared to those being dealt with in 2015. 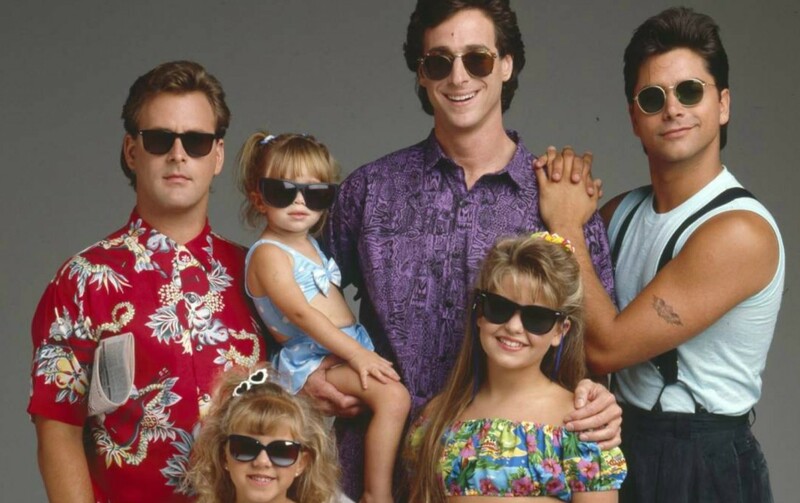 Sure, those problems might not seem as relevant in today’s world, but no one who watched Full House back then is going to be watching Fuller House to learn a lesson. Another big issue I have with reboots and their “nostalgia” marketing campaigns is that for a reboot to have content from which to mine new story lines, the setting of the reboot actually has to be different from the original. Therefore, we lose that wonderfully warm and contented feeling that comes from being able to believe things stayed the same, and nothing changed. Before I knew Fuller House was happening, I was able to believe that all of those characters continued to live in that house, none of them aged, and it was all sunshine and rainbows. Now I am forced to face the idea that things actually changed, and not for the better. I love that the original cast is clearly very proud of the show, and it absolutely dills my pickle that they all still hang out, but that would have been enough for me. While I’m obviously going to watch Fuller House, it’s not going to be for the nostalgia that I keep hearing about; it’s going to be out of loyalty to the original show, which was perfect just the way it was.